These appliques are fairly standard. Basically nail "stickers". The design I chose, called Carnivale, is jewel encrusted and has a nobby texture. The package says they can be worn on a natural nail for up to a week and up to two weeks if applied with a UV-cured gel overlay. Personally, the designs are a little too blinged out for me, so I didn't test them for wear time. My nail beds are really curved with a skinny cuticle line. I had to go one size up in order for the applique to wrap from side-to-side around the tip. I used an orangewood stick to tuck the sticker in around the edges. After I cut off and filed the excess at the top...there was some fraying to deal with, but in all - they're really very simple and quick to apply. I did my homework and discovered that Dashing Diva launched in 2003 as the world's first branded chain of nail spas. 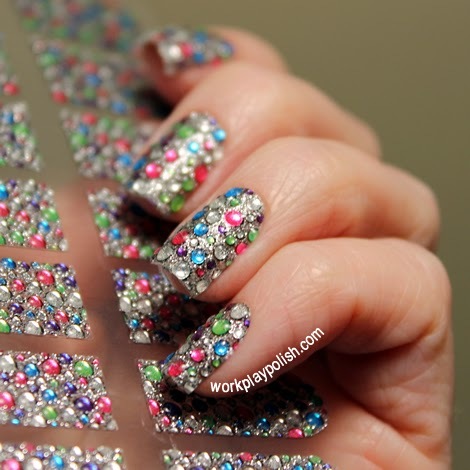 In 2009, they formed the Dashing Diva Professional line which includes artificial nail products, nail art supplies, the gel life™ UV soak off gel system and a line of blinged out nail appliques. Unfortunately, these products are only available to professionals from a distributor or at a license-only beauty supply store (but I did see them on ebay). I think they're comparable price-wise to Sally Hansen or OPI appliques (but I'm not sure since I didn't pay retail). I do think they have some unique designs.